How can I delete my device/account? To delete items just click on them, make sure they're not set as Missing, and then click on the options gear icon on top. There, you'll be able to rename or delete them. 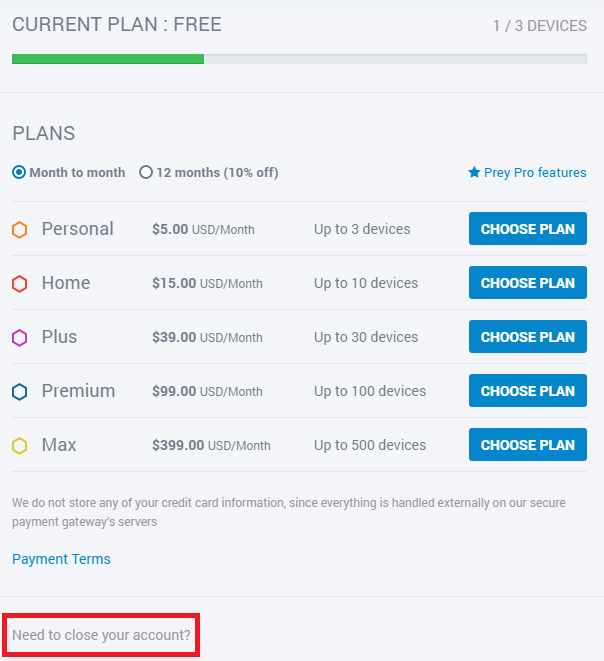 If you run short of devices, remember we have Pro plans that will give you the chance to add as many devices as you want. You can close your account from your Prey Settings. You'll see a grey "Need to close your account?" link at the bottom. Once you close your account all your data will be gone. Your protected devices, the reports, and all the information that was so useful once. So, please be careful.